The 2019 Teacher Training is now Full. Stay tuned for our next one! Now, more than ever, the world needs LIGHT! This is the opportunity to connect to your Truth, your Heart Wisdom, and to share your light with the world! Senior Teachers Gina Newlin & Zainab Zakari bring their combined 20 years of teaching, wisdom, and deep passion & zest for living in truth to this Mighty Yoga Teacher Training. They have designed an innovative and nuanced program, rooted in the ancient teachings of yoga as well as drawing from the modern wisdom of today’s changemakers, to transform your life on and beyond the mat starting as soon as possible! Enrollment is limited. Don't wait, sign up today! In this Vinyasa Yoga training, you’ll gain tools & learn techniques through asana, philosophy, and observation of our natural rhythms. Connect the dots through personal inquiry & study, inspirational readings, and group discussion & explorations. Then impart the unique blend of your heart’s teachings, growing insight, creativity, and passion to guide inspired, joyful, & empowered flow to your community! Your teaching journey is spread over five months and includes 10 weekends of learning, growing, and empowering, ALL with HEART! This program is led by 500hr-Yoga Alliance certified instructors, Gina Newlin & Zainab Zakari, and also features faculty from the Mighty Yoga Teaching Team and other dedicated experts in their fields. What makes you Mighty? We’re here to help you share that with the world! Join us for one of our info sessions to learn more! Sessions will be scheduled throughout 2018 in our Mighty Lounge. Please email us at NYTeacherTraining@mightyyoga.com if you have any questions. Weekend sessions will generally begin Fridays at 6pm. Saturdays & Sundays will span 8am through 6:30pm, including breaks. Please note, this may be subject to change within the flow of the training. Trainees will be updated as needed in a timely fashion. We highly recommend you avoid scheduling any other outside commitments during these weekends. Plan to dedicate these entire weekends to your training, study, and getting a good night’s rest in between! A minimum 1 year of yoga asana practice. An unquenchable curiosity, an interest in personal growth drawing from various methods and philosophies, and a desire to serve the greater good! It is strongly recommended that you have taken classes at Mighty Yoga if you are interested in applying. Are you ready to LIGHT UP the world? Application Fee: $25. Non-refundable and non-transferable. Applied towards tuition, if accepted. Tuition: $2950. $500 non-refundable deposit due within one week of acceptance. Tuition must be paid in full by January 10, 2019. Super Early Bird Discount: $2550. $500 non-refundable deposit due within one week of acceptance. Tuition must be paid in full by September 15th. This is a savings of $400 - Limited to the FIRST FIVE students to apply. Regular Early Bird Discount: $2750. $500 non-refundable deposit due within one week of acceptance. Tuition must be paid in full by December 1, 2018. This is a savings of $200! Tuition Payment Plan: $3050. $500 non-refundable deposit due upon acceptance plus 5 additional payments of $505, set-up via autopay on the 1st of each month, Jan-May. Tuition includes a 5-month unlimited class pass, a $745 value! The application fee ($25) and deposit ($500) are non-refundable and non-transferable, and will be applied towards tuition. The deposit is due within 7 days of acceptance to reserve a spot in the training. Unless on a payment plan, full tuition is due by January 10th, 2019. No refunds for canceling within 21 days of the training start date. Students will receive an email confirming acceptance and payment. Mighty Yoga reserves the right to amend this policy at its sole discretion. Please fill out our Application and submit a $25 non-refundable & non-transferable application fee. Once you have received a formal acceptance, submit the $500 non-refundable deposit to reserve your spot! This deposit may be paid online or by check, mailed to Mighty Yoga, 106 W State St., 2nd Floor, Ithaca, NY 14850. 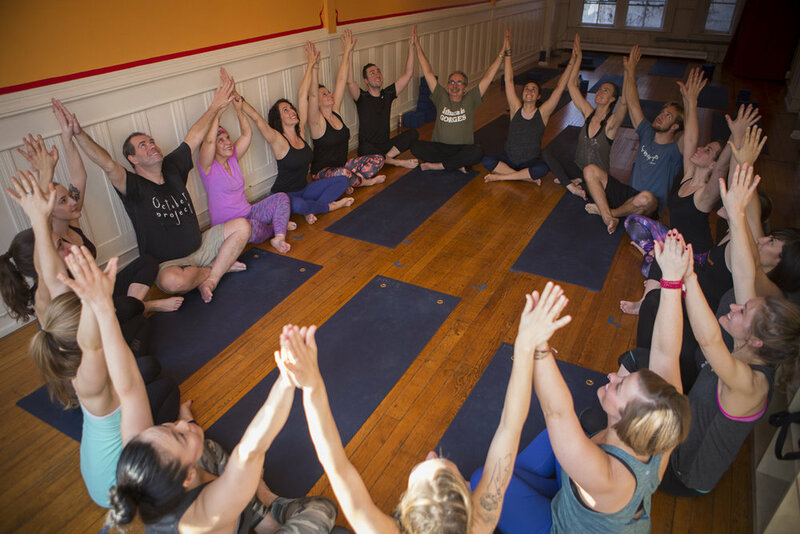 Gina Newlin took her first yoga class in 1995, dabbling in Iyengar, diving into Ashtanga, and immersing in Kripalu and Vinyasa Yoga until the spark to teach was ignited in 2006. A 500-hour Registered Yoga Teacher/200-hour E-Registered Yoga Teacher, and Certified AcroYoga Teacher, she combines traditional roots with creative, vinyasa wings to create an evolving offering which balances precision with freedom, and strength with fluid grace. These elements have proved to be transformational on many levels, healing her knees and changing her relationship with herself and her experience of the world. Profound gratitude is offered each time she steps onto her mat for the loving guidance and inspiration she’s received from many gifted teachers, including Steven Valloney, Jason Nemer, Jenny Sauer-Klein, Seane Corn, Hala Khouri, Chris Loebsack, Desiree Rumbaugh, and Ally Hamilton. Zainab has been teaching yoga since 2007, and she currently teaches all levels of Vinyasa Flow in and around Ithaca, NY. Her classes feature several styles & traditions including Prana Vinyasa Flow, Ashtanga, & Viniyoga, and they bring attention to anatomy, alignment and movement. She enjoys the mindfulness, physical awareness and playful adventure one can find in yoga and strives to integrate these elements, along with humor and kindness, into her classes. Zainab has happily studied with and is eternally grateful to Prana Vinyasa Flow founder Shiva Rea and the Prana Flow tribe in addition to her foundational teachers Lisa Bennett Matkin and Charles Matkin. Zainab is an E-RYT 200 certified instructor and is 300hr-certified in Prana Vinyasa Flow. She remains a student of life and has also published writings in media, including DoYouYoga.com, Fit Yoga, Women’s eNews, Zink, & Living MySore, a former online magazine. Please email us at NYTeacherTraining@mightyyoga.com if you are interested in joining us and/or if you have any questions.